Look up into the night sky and count the moons. You can see only one moon, “the” Moon. But does the Earth have any other moons? Around the Solar System, multiple moons are the rule. Jupiter has 67 natural satellites, even Mars has two asteroid-like moons. Could Earth have more than one? Officially, the answer is no. The Earth has a single moon. It’s possible Earth had more than one moon in the past, millions or even billions of years ago. Strange terrain on the far side of the Moon could be explained by a second moon crashing into it, depositing a layer of material tens of kilometers deep. Moons could come and go over the billions of years of the Earth’s history. For example, Mars has two Moons, but not for long. Phobos, the larger moon, is spiraling inward and expected to crash into the planet within the next 10 million years. And so, in the future, Mars will only have a single Moon, Deimos. It’s also possible that the Earth might capture a Moon in the future. Neptune’s largest moon, Triton, orbits in the opposite direction from the rest of the moons around the planet. This suggests that Triton was actually a captured Kuiper Belt Object which strayed too close to the planet. In fact, we did capture a 5-metre asteroid called 2006 RH120. It orbited the Earth four times during 2006/2007 before getting ejected again. So we can assume events like this have happened in the past. Additionally, we might have more moons, but they haven’t been discovered yet because they’re just too small. Researchers have calculated that there could be meter-sized asteroids in orbit around the Earth, remaining in orbit for hundreds of years before gravitational interactions push them out again. Asteroid 3753 Cruithne is in an orbital resonance with the Earth. It has a highly eccentric orbit, but takes exactly one year to orbit the Sun. From our perspective, it follows a slow, horse-shoe shaped path across the sky. Since the discovery of Cruithne in 1986, several other resonant near-Earth objects have been discovered. There’s 2010 TK7, the Earth’s only known Trojan asteroid. It leads the Earth in the exact same orbit around the Sun, in a gravitationally stable point in space. So, the answer… Earth only has a single Moon. Today. We might have had more moons in the past, and we might capture more in the future, but for right now… enjoy the one we’ve got. What are some objects known as Earth’s other moons? Did Earth have more than one moon in the past? You might also enjoy this episode of Astronomy Cast: Where did the Moon come from? In 1986 D. Waldron in Australia discovered a 5 km diameter companion to Earth a co-orbital near Earth asteroid. He named it 3753 Cruithne, pronounced Crueenya, after a Celtic tribe also known as the Picts. It has a very strange orbit about the sun which is elliptical and sweeps in passed Venus almost to mercury and then out almost to mars. One orbit takes almost exactly a year. It is choreographed so that the orbit is stable and Cruithne will never strike the earth. It takes one year for Cruithne to orbit the sun, as does the Earth and the Moon. Just as the moons orbit is transformed from a sinusoidally wiggling ellipse about the sun into a nearly circular orbit of the earth when viewed in the earth frame of reference, so to does Cruithne’s orbit present an interesting pattern when viewed from a reference frame attached to the earth. (The transformation from the sun frame to the earth frame is well shown in a movie on Paul Wiegert’s site.) When viewed from a point above the north pole of the earth the asteroid Cruithne follows a type of complex horseshoe orbit. Another co-orbital asteroid in a horseshoe orbit, named 2002AA29, it is only 100 m in diameter. It comes near the earth every 95 years, most recently January 8, 2003. 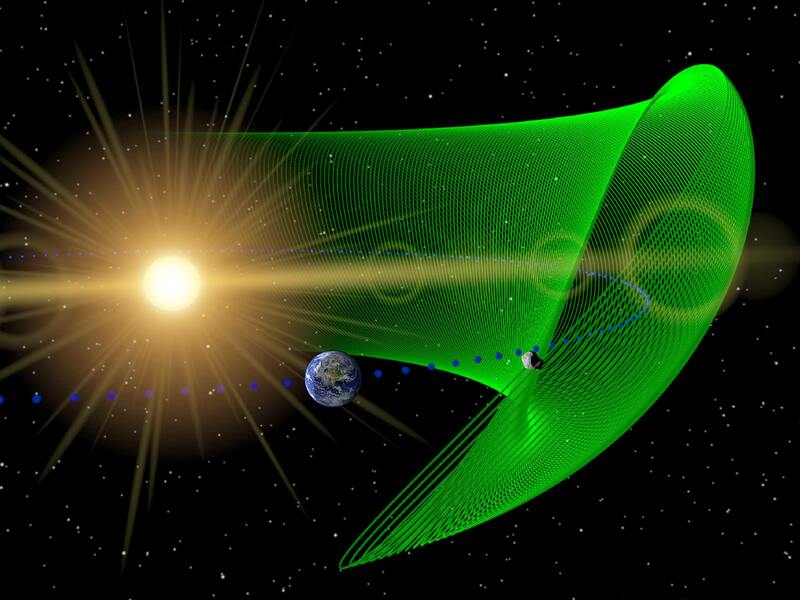 In another 600 years it will orbit the earth once a year, then after 50 years of orbits drift away again. It is a quasi satellite of earth at a distance of 0.2 AU. It is 100 m in radius. (It last orbited earth in 572 AD.) Viewed from the earth frame it sometimes orbits over the poles, toward and away from the sun. It thus can claim to be earth’s third moon, on a part time basis. the planet that have plenty of moons?